1. Yaak has the lowdown on the latest shidduch - Archie and Veronica are getting married! 2. hubscubs has the clip of Mr. T. throwing out the first pitch at a Cubs game, and singing Take Me Out to the Ballgame! Last week a retired Supreme Court Justice discussed the issue of mehadrin buses. In essence, Justice Dorner supported the right for the haredi community to have mehadrin buses, as long as alternative buses were available for people who do not want to ride on the mehadrin buses. As a method of pressuring the Ministry of Transportation to resolve the issue, Justice Dorner called upon the secular public, and everybody else who is against being forced to use mehadrin buses, to get on mehadrin buses and sit in the wrong seats. Women should sit in front, men in back, etc. She said this should be done by groups of people, as individuals would probably not have the strength to withstand the pressure of the people who will scream at them (or worse). Dorner's call to action is a bit extreme, and the haredi press went to town on it vilifying her for her statements. The truth is they really misread her, as in general she supported their right to separate transportation even though it goes against all human rights. All she wants is that wherever there is a "mehadrin" line, there should be an alternative as well for people who don't want the "mehadrin" rules. So, the haredi press and forums all call her anti-haredi for her call to action. Yet, I seem to recall that signs were plastered all over Jerusalem (and I think in Bnei Brak as well) about half a year ago, by the people running the ocmmittee dealing with the mehadrin buses, calling on haredim to put facts on the ground and whatever bus they get on they should sit in a "mehadrin" style - women in back and men in front. Even on buses that are not mehadrin and are not part of the attempts to make mehadrin. So, it is ok for them to call on their public to "take over" other lines and implement policy with facts on the ground, yet when other people do the same exact thing, they are suddenly vilified as being anti-haredi and not as liberal as they purport to be. Don't forget to make your Eruv Tavshilin. Here in Israel it is a rare occurrence that it is needed, so it is easy to forget.... Don't forget! Go do it right now, before you forget again! Yes, I decided to start numbering them (like how parshablog does), and yes, I picked a random low number to start from - I did not go back and count how many I have done in the past. 2. Guess Who is Coming to Dinner talks about Omering and linguistics in a yekkishe community. On another note, I just noticed that she is Joey's mom. 3. Snoopy The Goon does not like Yisrael Beiteinu. 5. The Way talks about dogma and humanism, explaining why it can hurt to follow someone else's beliefs..
Today the Knesset voted on a new bill proposal by MK Zevulun Orlev - the bill giving a year of jail time to anybody who calls publicly for negating or denying the State, if it will likely lead to actions against, shame or lack of loyalty to the State. The bill passed. I am not a big fan of the idea of the bill, but that is not the point. what I don't get is the response of MK Ahmed Tibi. Tibi said "We will not recognize Israel as a Jewish and Zionist state, despite the draconian law of MK Orlev..."
This is an MK in the parliament of Israel? not recognizing the basic nature of the State? If he did not want to recognize the State, he should not be serving as MK - not even from israel's point of view, but from his own perspective. His serving as MK is recognition of Israel. Nobody has any permission to relinquish in any way any part of our heritage. Jordan is also part of the Land of Israel. As Jabotinsky and the people of the Irgun said "The Two Banks of the Jordan River" - This is ours and so is this. A lesser known name for the holiday of Shavuos is "Chag HaMayim". The first time I heard of this was when I was in yeshiva in Israel, probably my first year in yeshiva in 1990, and walking to the Kotel for sunrise davening. From the yeshiva, the quickest route to walk was right down Jaffa street all the way to the Old City. I remember the throngs of people - all the different types of people - walking through downtown jerusalem. The crisp early morning air had a festive feel to it. Suddenly, bam. People all around are being hit by water balloons. They are smashing into the ground and exploding, spraying water everywhere. Not knowing what this was all about, I asked someone. They told me that Shavuos is also known as "Chag HaMayim", and the secular always throw water at the religious passerby on their way to the Kotel. They keep that holiday religiously. In Algeria they would ride on their mules and pour water on each other while singing. This was thought to be a segula for a successful crop of fruit. In Tripoli they would go out in the fields on the second day of the holiday and pour water on each other. it was thought to be a segula for having lots of kids. In Morroco they did this because water is the symbol of blessing, as well as the symbol of Torah. This year this poses a problem, considering the serious water shortage we are encountering. In Beer Sheva the Municipality has announced that the residents should be careful and not waste water and not throw it at each other this holiday. I am amazed at how quickly public opinion turns, based on absolutely nothing. The government has done nothing, has changed no policies, has provoked nobody. At least no more than any other previous government. As a matter of fact, the Netanyahu government has already removed, quietly with almost no fuss, more illegal settlements than any other government. Yet it seems the Netanyahu government is coming under increasingly heavy pressure and criticism from governments around the world. From governments that were always friendly and always accepted the Israeli position. Suddenly, we are hearing daily about new conditions being placed on Israel for peace with the Palestinians, and Netanyahu is quickly becoming persona non grata among the world leaders. For no reason. Did the forthcoming Olmert bring peace? Did he commit publicly to Two States for Two People? Did PA Pres. Abbas commit to Two States for Two People? Did Ariel Sharon? Did Yitzchak Rabin? Did Ehud Barak who offered 98% of what the PA was demanding at the time? They all committed to the Road Map towards a peace treaty. As did Netanyahu. So what has changed? Rav Yisrael Ariel, head of the Temple Institute and a former paratrooper involved in the liberation of Jerusalem during the Six Day War, talks about some of his recollections from the war. Rabbi Ari Enkin writes about an interesting holiday I never heard of before - Yom HaMeyuchas. A Soldiers Mother wishes her soldier son Happy Birthday! Shaul saw the cops ticketing a kid for biking with no helmet! This is the story as told to me by an occasional commenter.. This guy at work is a secular Jew. Yet when he travels, wherever he goes, he tales along a pair of tefillin. Why? He does not wear them when he is in Israel, nor does he don them when he is traveling. he simply takes them along. So why does he bother? His father told him (a long time ago), that whenever he travels he should take his tefillin along. So he does. On the one hand he is an idiot. On the other, at least he is thinking about his tefillin and he knows they have some sort of importance - the pintele yid, as we call it, keeps it in the front of his mind. I wonder what Robin Williams, the real Patch Adams - or at least the guy who played Patch Adams in the movie - would think about this.. The Palestine Children's Relief Fund (PCRF) held a fund-raising picnic June 21 at the Railway Museum at Fairfax Station, VA. Along with food furnished by the Lebanese Taverna, free clown noses for all, and raffles for prizes ranging from Palestinian embroidered dresses to a subscription to the Washington Report on Middle East Affairs, the event featured famed humanitarian physician Patch Adams. Adams, who was immortalized in a movie starring Robin Williams, is known for establishing the Gesundheit Institute, which approaches medicine from a humane perspective, offering treatment to patients whom Adams considers members of his extended family, without asking for payment or accepting medical insurance—though it is funded entirely by donations. It is indicative of the great need for Palestinian relief that Adams took time from raising funds for his own institute to appear at the PCRF fund-raiser. After a brief introduction sent from Palestine by PCRF founder Steve Sosebee, Adams talked about his philosophy of medicine, the need in Palestine, and his journey there. Three video selections of Adams and his traveling clown companions highlighted his work in Gaza. The first showed Adams being a "quiet clown." As the baby's mother watched, Adams held and cooed to a tiny premature Palestinian baby, who watched with wonder the gentle clown's bright colors. The second clip depicted what can happen at a Gaza checkpoint when a bunch of clowns show up. Palestinian children beamed and giggled at the antics of Adams' team, and—even more of an anomaly—young Israeli soldiers, caught up in the chaotic fun, allowed Palestinians to walk through the checkpoint as Adams and his troupe pulled the soldiers out to dance. The third video, Adams explained, was an unscheduled stop. While delayed, they spotted "giggling girls" at a school. Unable ever to resist giggling girls, Adams admitted, he sent in the clowns. Amid much hilarity, these young Gazan girls got a break from the daily realities of living under a brutal occupation. Endorsing a two-state solution and the dismantling of all settlements, and condemning the Israeli treatment of Palestinians, Adams also revealed that it was an Israeli hospital that funded his trip to Gaza. Having traveled in Afghanistan and Israel, as well as other parts of the world, Adams promised to return to Gaza. Anyone wishing to travel on a clowning mission with him is free to do so, Adams added, although he did reserve the right to introduce new clowns to the experience on less dangerous trips to Russia, China or Tibet. Adams poignantlydemurred that he did no more than an average mother does every day, and said he made clowning trips in an attempt to do his part to stop violence. "I would like love's 'specialness' to be commonplace," he explained. And in the story that just won't go away, here is an interview with a soldier who witnessed, and spoke to, Rachel Imeinu, during the Gaza Operation Cast Lead. Listen to it yourself (audio only) and come to your own conclusions. He describes the whole thing, though he cannot say where in gaza he was and what unit he is in. From what he says it sounds like she was not really simply an old woman walking by. Rather, she was some spiritual, or ghostly, form. he says she was not set on the ground, was more of a figure, did not seem to have arms or legs, and he could not see her face. The poor guy says he has not been able to sleep a restful night since he saw her. He went to many rabbonim, including Rav Ovadya Yosef, who told him that the time has come to tell the story, as he witnessed a miracle. She told the soldier she came because of the prayers of so many jews, so from above they sent her down to save them. The soldier refuses to say whether others saw her or not in other such instances. He says he saw her, but was not at the other sightings, so he cannot say what happened there. New Immigrant or Real Israeli? Imagine this - a guy driving down the highway to Eilat (a flat, monotonous highway that is easy to lose track of your speed), is caught driving 50kmph (about 31mph) faster than the speed limit. Blip Blip (cop blares his siren) - "Mazda - Pull over to the side of the road." "Officer, what is the problem?" "Do you realize how fast you were driving?" "Umm, I was driving at about the speed limit. why?" "Sir - you were driving, or should I say flying, at 141kmph. That is 50kmph above the limit. I am confiscating your license and you can get it back in the police station in Eilat." Eventually this went to court. In court, the driver again claimed he was driving the speed limit, the police radar gun confused his car with a different car that was passing him, etc. a number of claims that the court rejected due to inconsistencies in his story. Then he claimed, "Your honor - I am a new immigrant and don't speak or understand Hebrew very well". The courts eventually realized after some background checking that he is a doctor and has been living in Israel for 28 years! After 28 years he still considers himself a new immigrant!!?? With that claim, he shows himself to be a real Israeli, and as far from a new immigrant as you can get! A number of years ago, the Ministry of Transportation tried to invigorate drivers and raise their level of awareness on the road by frightening them into driving safely. They put signs all around the country at dangerous road spots - dangerous defined by multiple accidents happening in any given location - stating how many road accidents and how many people were killed at that spot within the previous 12 months. As if an overtired driver is now going to wake up because he sees these signs. The Highway 38 is known as one of the most dangerous roads in Israel - It is a 2 lane highway leading to a city that has grown from 20,000 residents to nearly 100,000 residents. 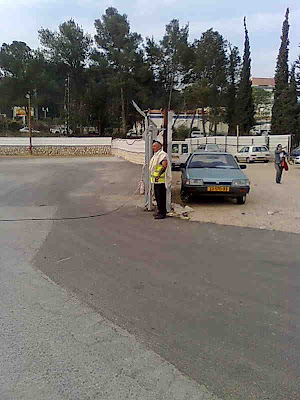 The original 2 lane roads are not nearly enough for the needs of Bet Shemesh transportation. With high numbers of people on the road, someone will swerve, or miss one of many curves on the unlit highway, and run into the opposite lane or hit the barrier off the road. The Ministry of Transportation, in coordination with the Housing and Construction Ministry, in coordination with the city and mayor of Bet Shemesh, have agreed on the need to upgrade the road systems around Bet Shemesh. The real reason behind the decision is because of the urgency Ariel Attias, Minister of Housing and Construction, feels to build new housing - all around the country, including Bet Shemesh. He cannot build thousands of new apartments in the Bet Shemesh area with the current infrastructure. So thanks to his new push for building, we are finally getting the upgrade we deserve. They will plan to expand the road, along with increase the lighting. In addition, they are issuing tenders to complete the development of the Road 10 that has sat unfinished behind BS-RBS for a number of years. Gotta see it to believe it, but at lest there is hope. If anyone can push this through it is Ariel Attias. WestBankMama wants to understand the meaning of "natural growth". A Time of the Signs shows a sign that seems to need nothing more than its simple message to convey the urgency it requires. Joey Guttman on Millionaire Game Show - Jewish Clips and Video has the clips of the show. There recently has been a debate in the secular press about how to deal with a phenomenon of a haredi takeover of a secular neighborhood. Ramat Aviv is a high end secular stronghold in Tel Aviv. It is a well-to-do neighborhood, and the "elite" of the secular world live there. It seems that an increasing number of haredi families have been moving in to the area recently. I think they are mostly chabad, if I got the correct impression from the articles. With them moving in, it does not just mean you suddenly have haredi neighbors. It means they need a shul, they need schools and kindergardens. Maybe stores that sell foods with the kashrus levels desired by these families. etc. The papers have been running articles written by various residents -some against the haredi families "taking over" the neighborhood and justifying trying to stop them - they claim they are trying to make the kids religious, they are putting up illegal structures and ruining the style of the neighborhood, they are noisy, etc., and some saying there is nothing wrong with them and being liberal and open-minded means putting up wit and accepting people who live differently than you. The Yated Ne'eman last week ran an editorial blasting the secular movement to get rid of the haredim who have been moving in. The editorial said that the secular who live their lives claiming modernity and liberalness and accepting of everybody then go ahead and chase out religious Jews, it is pure hatred of religion and hypocrisy of their standards, etc. The editorial basically was what I call the le'shee'tashcha form of criticism. "Le'Shee'tascha" is a term used to mean "according to your logic". meaning I personally don't necessarily agree with what you are saying, but according to what you are saying, it means you must do x, y and z. So the Yated was saying that these secular residents live by morals they believe to be x, y and z, but they are not really living by those morals, as soon as it relates to religious Jews. I call this "Le'Shee'Tascha" by the Yated because the Yated does not really believe in such openness and acceptance of everybody. Anybody who lives in a haredi nieghborhood knows of stories where residents were pushed out because they did not live according to the standards of the local haredim. Even among the Dati Leumi there are many communities that have acceptance committees and reject applicants who live different lifestyles. So, on the one hand we can say that they are hypocritical - criticizing the secular for not letting religious live in their neighborhoods when they also do not let secular live in their neighborhoods. but on the other hand we can say they really agree 100% with the sentiment of not letting other lifestyles live nearby, but the criticism is "le'shee'tascha" - according to your liberal beliefs, you should be more accepting.. I have been a fan of Stephen King's writing ever since I was 14 years old. At the time I was in yeshiva, and our dormitory was right next to a branch of the Chicago Public Library. Of course we were not allowed to go and borrow books unless we had special permission, such as for high school research projects, but many of us used the library anyway. I remember walking in and seeing IT by Stephen King in the New Releases section. IT had been heavily advertised, and I was curious. Never before had a I read a Stephen King book, and I was a bit apprehensive because of his reputation. I took out IT. I remember staying up 3 nearly complete nights - just getting a small amount of sleep each night - and finishing the book. It had something like 1000 pages, and was humongous as far as your average novel goes. Since then I was hooked and read every single thing I could get my hands on written by Stephen King (until a few years ago). I don't remember ever hearing Stephen king weigh in with his opinion on the issue of Israel and the Palestinians, so i never had any idea what his positions were. I never even thought of him like that - as having a public stance on such things. he was a novelist, and a rocker, but that is it. So what caused my blood pressure to rise? Was Gaza the topic the DFA’s spindoctors were pushing? Possibly. Was the position on Gaza the most objectively newsworthy? Again, possibly: the Pope is in the region and Ireland tends to be at one end of the European spectrum of opinion on anything to do with Israel. The third possibility, and the one that seems to me most likely, is that the media has a fixation on Israel (and its supposed crimes) which is, for want of a better word, disproportionate. That’s why the line about Gaza led several media reports of Minister Martin’s meeting. If I were Jewish, I would be told I’m paranoid for thinking the world and its media are out to get me. After all, the fact that Israel is the world’s one and only Jewish state – amidst a vast ocean of Muslim states – inevitably makes many Jewish people think it’s them, and not Israel as such, which is in the media’s sights. But I’m not Jewish. Besides, just because people are paranoid doesn’t mean others aren’t out to get them. It goes without saying that any civilian death is a tragedy – and, very often, an outrage – but search for Chechnya on the DFA website and you only receive one-tenth of the number of hits that you do for Israel. No-one believes the DFA is somehow in league with the Russians and supports their quasi-colonial war against Chechnya, but it does go to show some perspective has been lost somewhere along the line. Yes, there is public feeling about the Palestinians and their rotten deal. I’ve never heard Chechnya being discussed on the DART, whereas I have heard Israel being trashed on buses as well as at smart dinner parties. Besides, who’s ever heard of a "Sri Lanka out of Tamil Eelam" march through Cork or calls for a boycott of Russia? But whose fault is that? Dare I suggest, the media? As a result, Israel has learned a lesson from the Russians and the Sri Lankans: impose a media ban and the world leaves you pretty much alone. No one could condone the ban during the Gaza offensive – and being host to the world’s second largest press corps, after Washington, means you pay a high price in terms of stroppy hacks – but it does seem to work. I stand corrected - this article written by Stephen King is not the same Stephen King as the novelist, but an Irish writer. I am leaving it up, because it is still a relevant article. Avigdor Lieberman related from his meeting with the French Foreign Minster, Bernard Kushner, "I told him when I first arrived in Nokdim there were 12 children. Today there are 170. I said to [Kushner]the children cannot go the summer and the winter without daycare. [Kushner] asked why they cannot go together with the Palestinian children in Bethlehem, just like the whites and blacks learn together." Lieberman explained there is a basic lack of understanding of the complicated reality in Israel. Minister Gilad Erdan interjected, "Parents will not agree to educate their children in Bethlehem, to receive an education in how to deal with explosives." 3.........2................1...........[gun shoots]. And they're off! Shabbos in a religious neighborhood means you have very few cars, if any, driving on the streets. That makes it relatively safe for the kids to play in the streets. One of the favorite pastimes of the kids is what I call "Bimba Drag Racing". Those little plastic "bikes" pictured to the left are what we call in Hebrew - "Bimbas". I have no idea what they are called in English. They are normally used by 1-2 year olds who cannot yet ride a tricycle. But on Shabbos they take on a new life. Kids, up to the age of 6 or 7, can be seen riding them down the streets. A real adventurous one will even have a passenger riding along. And being that Bet Shemesh and Jerusalem (and it is popular as well in Zichron Yaakov according to a fellow twitterer) are so hilly (I doubt the Bimbas are used the same way in flatter terrains), the popular Shabbos afternoon activity is rumbling down the streets at high speed on the bimbas. These bimbas make a tremendous amount of noise, considering the thick hard plastic wheels, and the weight of the 6 year old kid (or two of them) on it, rolling down a paved street, and if the kid rides right by you it feels like the beginning of a mild earthquake.. The best is when the kid hits a speed bump, and it looks like the driver is destined to be thrown from the bimba, but he holds steady and hangs on. Very cool, but very noisy. The real ruckus is when , as I saw this shabbos, what might be called the bimba drag race. Not just one bimba hurtling down the hill, but 3 bimbas, each with 2 kids on it, were hurtling down the hill at high speed. I nearly lost my stomach watching it, but these kids were in heaven! Some want to spoil the kids fun. 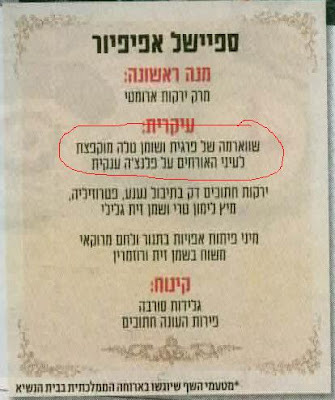 A psak was printed in the local weekly "mekomon" (local newspaper) Chadash that says riding bimbas on shabbos is prohibited. The psak was from the Rav of Kiryat Sefer/Modiin Ilit, Rav Meir Kessler. Rav Kessler bases his prohibition on the fact that it is dangerous (I dont know of any bimba injuries, though I can easily see it happening), along with the fact that it is noisy and robs families of the restful Shabbos. Therefore, Rav Kessler says, using bimbas is prohibited in public areas and Shabbos and holidays, both because of the disturbance, and because of the behavior itself. Will this be the end of Bimba Drag Racing? Holy exposures describes what can only be a most unusual pious person in RBS 2009. Mazel tov to Azriel Chayim. Reb Akiva talks about Yom Yerushalayim, rhetoric and faith. In Taeneck they don't collect the garbage? The Way starts with a funny joke then discusses ethnic/racist humor. he should have just posted the joke. הרבצר from elimand on Vimeo. The State of Israel is a gift that was given to the Jews after 2000 years of exile, and our job is to guard this gift even if the world does not care if it would be wiped [off the face of the earth]. This Letter to the Editor appeared in the Yated Ne'eman this week. 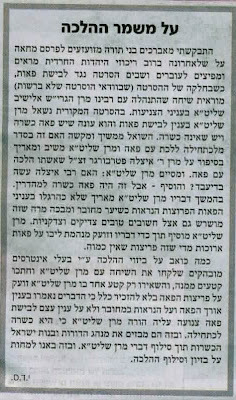 The letter describes a video being shown around in public areas, including Lag B'Omer in Meron, of Rav Elyashiv being asked by askanim about wigs being an acceptable method of hair covering or not. The video itself was shocking, as it showed the pushy methods used to get Rav Elyashiv to say what they want to hear and to respond to what they want to discuss, no matter how many times he showed his lack of interest in making an issue of something. Even worse, as the letter describes, is they then edited the video to only show a distorted picture of what Rav Elyashiv said. Rav Elyashiv said that in general sheitels are muttar, but certain types (too long, etc) are not because they are not tzanua. He spent some time talking about the "unkosher" wigs. They took the video and cut out the part of Rav Elyashiv saying that wigs are muttar, and only left the part where talks about wigs not being tzniyus and therefore assur. So not only can you not believe what you hear in the name of Rav Elyashiv, you now cannot believe even what you see Rav Elyashiv say, unless you are present when he says it, live. Another example of this is regarding Kosher cell phones. the askanim got the blessing of the gedoilim, including Rav Elyashiv, to make kosher cell phones and require those int he haredi community to only use these phones. These phones have only phone calls enabled, with internet and sms access blocked. 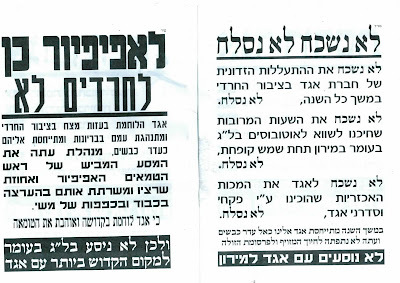 This week, the rav of a neighborhood in Bnei Brak penned a letter claiming that Rav Elyashiv never said sms is prohibited. He spoke with Rav Elyashiv recently on the issue a number of times, and Rav Elyashiv was concerned with the content being clean of nivvul peh and disgusting topics. The only thing he instructed the committee dealing with it to work on was to ensure the cleanliness of the medium. He further confirmed, in the name of Rav Elyashiv, that sms is fine, broadcasting news is fine, and all sorts of other methods of communicating (does not say internet access) with cell phones are all fine, and the committee is not to get involve din the content, or the medium, and their only job is to ensure that the broadcasts are clean (mostly problems with advertising). So, this is another example of Rav Elyashiv's words being taken out of context and distorted. Back to the strawberries again. I am only writing this because I wrote earlier about the strawberries, specifically quoting Rav Amar allowing strawberries because he considers the bugs to not be visible to the naked eye. I feel it only right to mention the latest turn of events. Rav Amar has backtracked from what he "supposedly" said in the shiur the other day in Karnei Shomron. In an interview to "Shas Youth" Rav Amar says he was quoted out of context, and he was not discussing strawberries. Rav Amar said that he was discussing the halacha of bugs that cannot be seen. He is not saying that is the metzius of the strawberries. Rav Amar says he mentioned strawberries in the context that if the bugs on strawberries are of this type, that cannot be seen, they would be allowed to be eaten. Because the experts say that the strawberries are infested with bugs that can be seen by the naked eye, one should be careful about eating them regarding the halachos of bugs, and of one cannot clean them properly, one should not eat them. Oh well. I guess this Shavuos will be blueberry cheesecake instead of strawberry cheesecake. Chana analyzes the season finale of 24 and compares it to Judaism. Very interesting analysis. Interesting discussion going on regarding the recent Kol Brisk Parsha sheet over in the comments at The Way. Jameel comments on Obama's plan to divide Jerusalem. RHM talks about a letter to the Yated about fathers not being allowed to attend Bais Yaakov daughters graduations. Josh Waxman continues the discussion Rabbi Ari Enkin began about Sefirat Ha'Omer, missing a day, and the Rabbi saying the Omer in shul. When discussing an even slight relinquishment of even remote territory in Jerusalem, it leads, logically, to Israeli relinquishment of Temple Mount, as it was in the past. Just two weeks ago we heard the words of the PA ambassador to Lebanon who said: "If Israel does not retreat to the '67 lines, it will become reality on the ground. With the implementation of the Two-State solution, the State of Israel will collapse and we will move forward.". 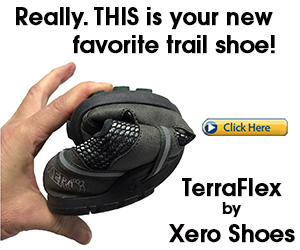 This is the Torah on one foot. This is how even those who see themselves as moderates see the situation. Battle of the tzedaka orgs has a winner for this round! Rosh Chodesh Sivan is Sunday. Erev Rosh Chodesh Sivan is the day for the famous segula of saying the prayer composed by the Sh'lah for the spiritual well being and success of one's children. Because Erev Rosh Chodesh is Shabbos, this should be performed on Thursday. That also means the tzedaka wars heat up looking for your money. Here are two ads from today's Yated Ne'eman. The first is the ad from Kupat Ha'Ir, and second from Vaad HaRabbonim. It looks to me like the Vaad HaRabbonim took this competition hands down. While the Kupat Ha'Ir ad was much bigger - a full page, The Vaad HaRabbonim are offering much more segula for your money. The Vaad HaRabbonim are saying their people will fast on the day, in addition to the prayer. Kupat Ha'Ir makes no mention of fasting. Kupat Ha'Ir just says they are going to pray. Vaad HaRabbonim say they are sending their minyan to pray at the grave site of the Sh'lah. Looks to me like Vaad HaRabbonim wins this battle of the charities hands down! As you might have noticed, ever since the municipal elections several months ago, I have avoided writing anything about the functioning of Bet Shemesh City Hall and the mayor. I did not want it to seem like I am a sore loser - after all, I supported a different candidate. As soon as election results were in, I decided I would not be sore about it and I would hope that Abutbol would succeed, despite my evaluation that he was not right for the job. His success would be the success of all of Bet Shemesh, and bellyaching because of being a sore loser does nobody any good. So I gave him a chance, and decided not to write about anything for a while. The reason I thought Abutbol was not right for the job is because he never really did anything big. he never led an opposition to the former mayor. he never led big projects and showed leadership. Sure, he helped a number of shuls get plots and build buildings (what chaver iryah has not done this?) - basically he is qualified to be the gabbai of a shul - not to run a city. That along with my concern that he would not stand up to certain elements in the city. For those reasons I chose not to support him. Enough time has passed that I now feel comfortbale writing about Bet Shemesh again. It seems my concerns were well founded. Moshe Abutbol runs the city of Bet Shemesh like a shlemiel. Sure, people love him - he is a nice guy and everybody will have a good word to say about him. If you call him up and tell him about a problem, there is a good chance he might dispatch a municipal employee to fix the problem. However, he takes no initiative. Abutbol campaigned on a platform of giving the city back to the residents. The city would be run in a professional manner, and the residents would have a say in what goes on and the residents would once again be able to be proud of living in Bet Shemesh with an efficiently functioning Bet Shemesh. The issue of the parks and the sports/gym equipment is a good example of the shlemiel attitude in the irya. They got complaints about the equipment. It does not matter right now whether it was for tzniyus or for safety. Instead of meeting and bringing an engineer and deciding if the equipment is safe or not or what should be done, they sent a tractor in and ripped out the equipment. The residents had to fight to get the equipment put back in a different place in a safe manner. But lo and behold, the city left the park more dangerous than when the equipment was there. They left the park full of holes from having ripped out the equipment. A kid could have snapped his knees or sprained an ankle running through the park! The city only sent someone to fix it after a number of complaints. The whole reason they took out the equipment (supposedly) was because of safety, and then they left the state in a more unsafe manner. That is but one example. Another is the neighborhood of Heftziba has been complaining for two months that they have had almost no water flow in the houses. The city once in a while responds that they are dealing with it and are looking for the source of the problem. They kept saying they were dealing with it, while the residents continued suffering for two months with almost no water. It turns out the whole problem was the handle on the water main for the area was partially closed the whole time, limiting the flow of water. It took them two months to check the water main. Another example is the increased number of complaints I am hearing that the 106 hotline service is not dealing with issues. A resident who sees a problem is meant to be able to dial 106, report the problem, and the city should deal with it. people are complaining about leaking sewage pipes, leaking water, garbage, etc. and it takes weeks before anything gets done, and then usually only by intervention after someone knows someone in the irya and calls them directly. You can read the local papers on any Friday and see more examples of this attitude. There are good people in City Hall. I know of some cases, and was involved in a couple, where chavrei irya got involved personally to resolve issue and problems. On an individual level these are good people who do good work. But as a unit of City Hall led by Mayor Abutbol, I am sad to say the city is functioning in a reactive mode, only dealing with problems when they can no longer push them off and ignore them. What happened to "Tnu La'Toshavim L'Natzeach"??? A husband and wife were fighting constantly. Clearly a lack of shalom bayis reigned in the house. They later got divorced. After a fight over whether or not he could use her car, they were up in the apartment. She was washing dishes, and he was eating bread with cottage cheese. His bread got wet - ostensibly because of her washing the dishes. He got upset (soggy bread is the worst! ), pushed her and threw cottage cheese at her. The judge recently acquitted the husband, saying that because they clearly had a bad marriage and a lot of friction along with fighting over property in the divorce, she cannot accept such testimony simply based on the words of the wife. She has a clear bias and cannot be relied upon. What a waste of good cottage cheese! 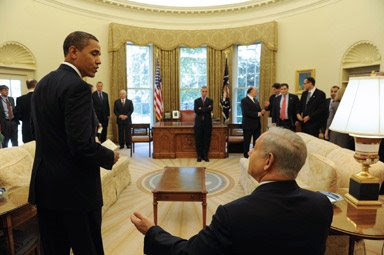 What do you think Bibi is saying to Obama at this moment? Continuous construction is the need of today to strengthen the security and the settlement bloc in the northern Jordan Valley communities. Continued construction reflects the political - security concept of Kadima, and is an implementation of the Olmert government's decision. According to Shneller, he and all of Kadima support the continued expansion of settlements. If that is really Kadima's position, they really need a better PR company to represent them. 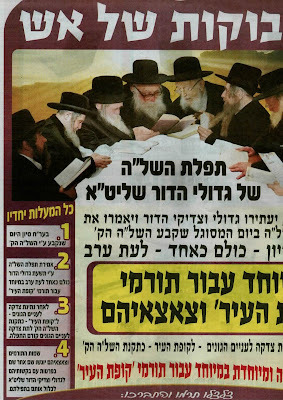 The [haredi] newspaper HaMevaser is reporting, as quoted on BHOL, that Justice Elyakim Rubinstein has decided to reject the petition of the "Reform" against Egged mehadrin bus lines. The decision to reject the appeal is based on the Ministry of Transportation saying that these arrangements are really informal - nobody (officially) tells anybody where to sit, and people by their own choice decide to sit with men in front and women in the back. Rubinestein accepted this claim and therefore decided to reject the petition. I think Rubinstein made a decent decision. If a community wants to live a certain lifestyle, no matter how much I disagree with it, they should be able to. They want buses like that, let them have buses like that. I don't want them to force me to live according to their lifestyle, but I have no problem with them living according to their lifestyle. They should be allowed to, just like anybody else is. The problem is, and I do not know if Justice Rubinstein addressed this in his decision (it does not say so in the brief article) is what to do when it is not seating according to the people's will - meaning if someone sits in the wrong seat what happens? Rubinstein accepted the claim that it is not official and is not enforced by the ministry. So if a woman were to sit in the front, technically nobody should be able to tell her to move - it is a willful decision to sit in the back and not official arrangements. So, if this is left vague, it will leave a lot of room for fighting - they will claim it is mehadrin and push women to the back even against their will, and the women (and their husbands sitting with them) will say it is only an unofficial arrangement and they cannot be forced to move. Leaving this vague based on such a claim by the MOT is leaving it open for future friction. In a similar note, Egged made a smart move by altering the arrangements on another bus line. The bus from Maale Adumim to Jerusalem used to make local stops in Jerusalem dropping off passengers, and would also allow passengers to get on the bus and ride locally. This led to some trouble, as the bus made a number of stops on Bar Ilan street - a haredi stronghold. It seems they would get on the bus and start telling passengers, from the RZ community of Maale Adumim who had been on the bus in their seats form the beginning of the ride, to move to the back or that they should dress more covered up etc. This caused friction, and Egged and the MOT received a number of complaints about it. The decision was to not allow passengers to get on in Jerusalem and treat the route like a local route. This means those haredi passengers would no longer be using this bus and causing friction with the original passengers. It is situations like this that we will see more and more of now that Justice Rubinstein made his decision. I have no problem with them having separate buses in their community and on their routes. If that is how they want to live, who am I to tell them otherwise? But when they start telling other people, that is where the problems begin. Jerusalem was captured once by King David who turned it into the capital of the Jewish Nation. Since then, Jerusalem has only been liberated...Jerusalem was not captured 42 years ago, only liberated. Ahmed Tibi is a politician fulfilling his public service. I understand his reasoning and his motivation, and he can express them as much as he wants. This item will come as good news for the strawberry lovers among us. Many in recent months have come out against eating strawberries - at least unless they are mashed - due to a serious infestation this season. Chief Rabbi Shlomo Amar, he of the ortho bling bling, has come out in favor of the strawberry in a recent visit to the Shomron, where he gave a shiur on the topic in the yeshivat hesder of Karnei Shomron. INN reports that Rabbi Amar said the prohibition never included eating bugs that can only be seen by microscope, and therefore strawberries are fine and can be eaten after soaking them in water and cutting off the tops. Whew. This came just in time for some strawberry cheesecake on Shavuos! My Blogrolling button is working again, making it easier to add new blogs to my blogroll - something I have not been able to do [easily] for the past few months while Blogrolling.com underwent a complete system overhaul. I will also try going through the list and removing dead or irrelevant blogs from the blogroll. The Way to No-Thing posted about making the case for Israel - from the viewpoint of an atheist Jew. i Life World posted more about UFOs and aliens - from a Jewish and Torah perspective. Haveil Havalim #217 is up at Shiloh Musings. JoeSettler wants to know where religious Jews can live, considering a recent flare-up in Ramat Aviv in which long time local residents are worried about the intentions of a local Chabad group that seems to be tryign to "take over" the neighborhood. Who knew that there was just a Gay Pride Parade in the city of Eilat? Raise your hands if you knew it was about to happen. The city of Eilat is thought of as an Israeli version of Las Vegas - what happens in Eilat stays in Eilat. It is thought of as being ultra-liberal in lifestyle (I don't think it is like that in its politics) - pretty much anything goes. Today in the newspaper there was an article about the Gay Pride Parade that took place in Eilat on Friday. The article was on Page 19 of the newspaper. OK, no big deal - after all Eilat is a pretty boring seaside resort vacation city. No big deal - not very exciting news. Yet, the Gay Pride Parade of Eilat was met with violence. A group of protestors, local residents of Eilat, went out to protest against the parade. It turned violent as the protestors began throwing stones and eggs. A couple paraders were injured and needed medical attention. And still the article only hit about 150 words on Page 19 of Yisrael Ha'Yom. I did a quick search to see if I could find any article on Haaretz or Ynet websites - I could not find one at all on Haaretz and found one way down at the bottom of the news updates of Ynetnews. Granted, I only did a quick search - maybe a more thourough search would result in more scathing headlining articles, but even a quick search should bring up an article on the front page. Why is it that when the religious, specifically Haredi, protest against the Gay Pride Parades, it makes page 1, it is discussed for days on end, threats of violence, assumptions of violence, etc. are all played up and the whole thing is made into a lot of noise. One time a couple of years ago a haredi man violently protested, stabbing a parader, and it was talked about in the news for days. The next year the news media went on discussing whether it would be repeated. To no end. Yet here we had, on Friday, a Gay Pride Parade that was protested, with violence, by secular (traditional perhaps) residents. And you can hardly find a word about it in the media - and to find even a bit you have to look hard. There is so much wrong with this, but it is oh so funny! I just read (offline) a story of a chassan who is suing the wedding hall for his own misstep. Ever been to a wedding where the chassan tries to step on the glass to break it, but just can't do it? Maybe the glass is too thick, or it rolls around and he cannot get a good angle, so he keeps trying... This chassan tried to smash the glass, but it didn't work. So he tried again, harder, and he caused a piece of glass to go up through his shoe into his foot, forcing him to get some medical attention - he had to disappear for two hours to go to a MAD"A station. The guy is suing the wedding hall for 65,000NIS for injuries sustained during the chuppa while ehe was trying to break the glass. The management of the hall claim that the chassan was dressed inappropriately for breaking the glass - he was wearing cloth shoes with a soft heel. They claim that his stepping on the glass, especially dressed in shoes the way he was, was by his own choice putting himself in danger. The judge ruled in favor of the wedding hall. He said that the chassan failed to bring witnesses and experts showing that the glass was made of materials making it difficult to break. As well, because it was a "two-glass" ceremony, i.e. the bride also broke a glass and she did so with no problem on the first try, clearly it was his own problem and not the hall providing him with an unbreakable glass. Personally I never have seen or heard of a "two-glass ceremony" with the kallah also breaking a glass. Not that there is anything wrong with it - I see no problem, just I never saw or heard of it being done. That charm necklace Chief Rabbi Amar is wearing in the picture during his visit with the Pope was for the purpose of warding off the spiritual effects of the cross worn by the Pope. The New York Times published the responses of a number of writers, including Daniel Gordis whom I particularly always enjoy reading, to the Pope's visit to Israel and Yad VaShem and his supposed missed opportunity by his pareve speech. The responses are interesting and the comments are just as interesting, each presenting differing perspectives. Here is an example of what is wrong with the kashrut system that we have. The mashgiach is directly involved with the site he is supervising. Often he is being paid by them, creating an obvious conflict of interests, but what is even worse is when they are caught giving extra benefits to the mashgiach. A mashgiach for the Tel Aviv religious council was given free room and board at a hotel under his supervision. Supposedly he was not even on duty at the time he was given the free room and board (if he was on duty and had to be there during the holiday because of it, it is understandable as part of the arrangement that they provide him with the room and board). he denies it and they are looking into it. What actually happened, and whether it is accurate or not, does not interest me. What does, is the fact that this happens. The hotel has the ability to give a benefit to the guy who is supposed to be supervising the kashrut. Will such a mashgiach who is receiving such benefits have the cojones to stand up to hotel management when he finds something wrong in the kitchen? It might only be a subconscious and subtle bribe, but it is a bribe nonetheless. This is one of the biggest problems with the hechsher system in Israel. Considering I have heard the heads of kashrut organizations complain about it as well makes me wonder why they don't bother changing it. Could be because despite it all they don't want the responsibility of paying the mashgichim and prefer, despite the problems, to dump it off on the hotel/restaurant. but it should be changed. I don't understand what all the horsetrading is over the budget the government is trying to propose. Didn't we just go through all this horsetrading when Netanyahu set up the coalition? They wanted money for x, y and z (each party according to its demands), Netanyaho offered, a, b, and c, and they agreed on m,n, and p. Is he not keeping the agreements he signed with the parties, so now they are renegotiating? He is keeping the agreements in the new proposal, but they want to change them? While one former Nazi (John Demjanjuk) is being deported from his home back to Germany where he might get some of what he deserves (he is wanted for the murder of 29,000 Jews in Sobibor - how can he possibly get what he deserves for that? ), another former Nazi is being given the royal treatment by Jews in the Holy Land. And while the politicians are all condemning him today because yesterday at the ceremony in Yad VaShem he did not ask forgiveness or even express sorrow over what happened in Nazi Germany, what did they really expect from him? He has not really been favorable at all to the Jews until now. Did they really think that by tripping all over themselves to show him some honor he would suddenly change his spots? Send the holy pope on his holy way and get the traffic back in order. Just because of the way he messed up Jerusalem traffic yesterday, and will likely do so again today, it was not worth this holy visit from a former Nazi. Most of the bonfires, generally arranged and managed by children, are left to burn down on their own. Everyone leaves when they have had enough. At the end, all that is left is some ash, a few burned out embers, and a bit of a mess, generally somewhere off to the side. I saw one shul have their bonfire and then later, when I passed by again, actually cleaned up after themselves. They had two guys from the group sweeping away all the ash and dirty parts that remained loose. This is something that you would not expect to see - so Kol Hakavod to the bonfire people who actually cleaned up after themselves! Kupat Ha'Ir in the shidduchim business! To continue the issue of the Kupat Ha'Ir problem with Shavuos and Shabbos...as they have advertised, they have solved the problem of "2 day yom tov" and davening 40 days in a row in Amuka, by setting up a generator and tent and having a minyan stay there over the holiday to daven there. There was some question as to how this would work. They recently publicized that they are sending a minyan of avreichim for the holiday to Amuka. Not yeshiva students. They wanted specifically avreichim, as avreichim learn all day along with having a special sensitivity to tefilla. As well, they have publicized the importance of this segula by relating that last year thousands donated to Kupat Ha'Ir for their tefillos at Amuka. For a number of months after the tefilla campaign, every Thursday and Friday they received phone calls informing them of mazel tovs of people from the lists who got engaged. They added that all the couples that got engaged were couple where both the chassan's name and the kallah's name appeared on the lists for tefilla at Amuka. A new idea for Kupat Ha'Ir is to go into the shadchanus business. They get these lists of names, so they should just continue, along with the tefillos, by recommending shidduchim from name son the lists! The newspaper printed the menu planned for the papal lunch today, and looks like they are ordering out from 'Alo Teiman! The main dish is one of my favorites, and a classic working Israeli lunch, Shawarma. Every year right before Lag B'Omer, the fight heats up over who will control Meron and the grave site of Rashb"i, the mehadrin status of male-female access to the site, and the transportation up. 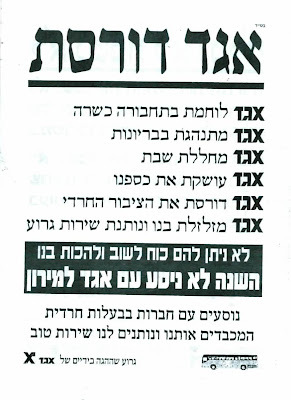 The pashkevils exhort the public to not use Egged's services to go up to Meron, considering how Egged tramples the rights of the haredi consumer on a regular basis (the one on the bottom left describes, for example, how Egged treats the haredim with brutality and like a flock of sheep, but is going all out for the Pope). We could use this guy to fill up the Kinneret! No more water shortage! I thought he is using all weapons in his guard duty arsenal. A friend suggested he is praying for the buses to run on time. Any other ideas? The Finance Ministry wants to start collecting 50NIS per day for hospitalization? I have a better suggestion for the people of the Finance Ministry. They should collect 10NIS per day for education, and 1 shekel for every citizen crossing the street at a crosswalk. A short while ago there was a notice in the news about the IDF enforcing policy about beards. Soldiers in the IDF are not allowed to have beards unless they meet certain requirements. The army rarely enforced this and similar rules. In an effort to improve the level of discipline, the army has decided to enforce these rules. no more beards. No longer being unkempt. No more letting things go. but because we live in a Jewish country, and the IDF has plenty of religious soldiers and wants to keep good relations with them, they had to show some flexibility on that. So they came up with a set of exceptions. Religious soldiers are allowed to have a beard, as long as they get the approval of their commanding officer. Along comes sefirat ha'omer when we show outward displays of mourning, such as not shaving and getting haircuts, and suddenly we have a problem. People who were able to shave as per the army rules until now, suddenly cannot. But they do not have permission to let it grow out. Yisrael HaYom newspaper wrote today about an incident in the army in which 6 soldiers affiliated with the Conservative movement wished to get permission to not shave during sefirat ha'omer. The army rabbi refused to give them recognition as religious soldiers and therefore their request was rejected. the rabbi said that he does not recognize the Conservative Movement as religious and therefore they cannot be considered religious. (they have appealed and are waiting for a response, but in the meantime they have had to shave because of this ruling). I do not understand this rabbi's position. I understand he does not want to give any tacit recognition of the Conservative Movement - just like most Orthodox rabbis have the position of not sharing a pulpit at events with Conservative/Reform rabbis so as not to be perceived as approving of them in their positions. He thinks that by approving the request of 6 individual soldiers, he will be perceived as approving of the whole Conservative Movement. It was not the Conservative Movement asking permission to be recognized as religious soldiers. It was 6 individual soldiers. And if they asked if they could put on tefillin, would the army rabbi not allow them saying they are not religious so they are not allowed? If they asked for time for davening, would he reject that as well? These were 6 individual soldiers. Since when do we reject the right of individuals, no matter their affiliation, to perform mitzvahs (granted, not shaving during sefira is not actually a mitzvah per se, but it is a widespread Jewish custom)? What right did this rabbi have to reject the request of an individual to follow Jewish tradition? The rabbi should be applauding every occurrence of his soldiers trying to keep tradition and custom, and not rejecting it. Sorry for the delay of this post. I was trying to find a copy of the video that could be embedded directly here... I have now given up and will just post it as is. The following video was recently publicized. It is a video made by soldiers in the IDF about the miracles they experienced and witnessed during the recent Gaza Cast Lead Operation. The IDF opposed the video being made, but they made it anyway on their own. The video is inspiring, and should be watched by all. A side note, when there was the big "debate" about the Rachel Imeinu story and whether it is true or not that she appeared to soldiers and warned them away from buildings laced with explosives, one of the reasons people opposed it was because "where are the soldiers that saw her?" - nobody interviewed anybody who saw her directly. It was all second hand information. Just after minute 27 in the video, a soldier gives firsthand testimony to seeing Rachel Imeinu and to being warned by her. Yaak wrote about and posted the video. The whole video is posted at Sodot TV. Hidabroot was the original host of the video, I think. But you have to register there to see it. I wonder if we can arrange a local game (instead of our regular Friday basketball?). Maybe start a league. Dr. Michael Oren is seemingly going to be the next Israeli Ambassador to Washington. His credentials seem to show he is highly qualified for the job, and his book "Six Days of War" about the Six-Day war was absolutely amazing. Dan Gordon, writing for the American Thinker, relates a very personal story of serving in the Israeli army, during the Second Lebanon War, alongside Michael Oren. What most people don't realize is that for the first few weeks of that war Israel actually had fewer troops on the ground than Hezbollah. They quite literally outnumbered Israeli forces on the ground until the last few days of the war. A battle had been raging and Israel had taken casualties. They were looking for volunteers to go into Lebanon as a covering party and hook up with several ambulances that were evacuating wounded. They couldn't land a chopper because it was right in the heart of Hezbollah strongholds and they would have been shot out of the sky by anti air craft missiles. Without saying a word Michael was the first to pick up his gear and volunteer. We were a half dozen middle aged reserve officers. We didn't have an ar mored vehicle, so we actually went into Lebanon in my Avis rent a car. After looking for the ambulance for what seemed like hours we realized there was a screw up in co-ordinates and we were sitting ducks in a rent a car in Lebanon. We headed back into Israel and waited at the border crossing for word on where the ambulances were. After a while the same officer found us and acknowledged that there had been a screw up in co-ordinates. Now there was another problem. There was an ambulance with four dead Israeli soldiers that needed a covering party to go in for their evacuation. Again it was too dangerous for helicopters to land. Again they were asking for volunteers. Again Michael was the first to pick up his gear and volunteer. My son had been killed at the age of twenty two in a horrific car accident. Michael's son had been wounded in action in a fire fight with terrorists. To all of us middle aged men these fallen boys could have been our sons. We went back into Lebanon in the rent a car. We hooked up with the ambulance in a wadi or deep ravine. Flairs were going off above us, which meant that Hezb'allah knew we were there and were hunting for us. We served as the covering force while the fallen were evacuated. Later Michael's daughter, who was serving as a social worker in the Golani Brigade, called Michael on his cell phone. Her unit had taken a lot of wounded; most of them were her friends. Michael turned to me and said, "My daughter needs a hug. Can I borrow your car?" The two of us drove down from the Lebanese border to Rambam Hospital in Haifa. Michael spent a half hour with his daughter; gave her a much needed hug and then the two of us drove back near dawn to rejoin our unit. That is the kind of man Israel's ambassador designate to the U.S. is. He wouldn't hesitate to endanger his life not only to recover wounded, but to recover the fallen, and though exhausted himself, drove round trip, four hours to give his daughter a hug when she most needed her father's love. There are other people who can amply describe Doctor Oren's experience in diplomacy. He has served a number of Prime Ministers and is a fellow at the Shalem Center in Jerusalem, which contains such luminaries as Nathan Shiransky and Lieutenant General (Res.) Moshe Ya'Alon. I, on the other, hand can tell you about the man. Both Israel and the U.S. would be lucky to have Doctor Michael Oren serving in Washington. Would you pay 15k for a shidduch? Will Rome conquer Israel again?